On every gas valve. Keep children from turning on the gas, yet release easily with a simple thumb pressure. Re­ move all keys if desired and carry one as a master key. Thus Illock Up" the range tight. The danger of small children running into a red hot cook stove is minimized or elim­ inated entirely with Chambers insulation. Authorities say that Chambers cooking preserves important vitamins and min­ erai salts. No Mother would want to give her children anything but the best diet! 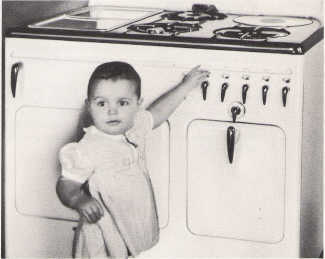 With all pot watching eliminated and at least two extra hours a day given to the housewife who cooks with the gas turned off, no Mother can afford to tire herself with old-fashioned methods of cooking.